Editor’s note: On Monday, February 26th, 2018, The Open Notes team will be joining the #BCSM Chat to discuss an important aspect of medical records: the physician’s notes. As the #BCSM community looks to learn more about the importance and value of medical records, we hope you’ll join us for this special chat event. Have you ever seen your doctor’s clinical notes about you? Notes are the most important information in our medical records, reminding doctors and other members of the healthcare team about our condition and plan for treatment. However, 94% of people in the United States do not have easy access to this information. Clinical notes are about you, and being able to read them is a federally protected right. Why should I read my notes? – Open notes give you the opportunity to review the details of your visit at any time. Evidence shows that most patients remember less than half of what they discuss with their medical professionals. Moreover, what they think they remember is often wrong! Open notes help make sure that you and your health care team are always on the same page. – Reading your notes is a good way to get a better sense of what your doctor or nurse is thinking, so you can feel more confident, prepared and in control. The more connected you are to your health care team, the more actively you can manage your health. – Whether you’re reviewing your treatment plan or thinking through different care options, the ability to read, review, and refer back to your notes makes it easier for you and care professionals to make informed, thoughtful decisions. Access to your medical information can help you ask better questions and make more confident decisions about your health. – Having access to what your doctor writes deepens the trust between you and your health care team. – And perhaps most importantly, reading and reviewing notes helps you to understand those medications you are thought to be taking, or should be taking. Adherence to a medical regimen can be critical, and OpenNotes can help a great deal with that task. What does a clinical note look like? Some people confuse notes with the “After Visit Summary,” or AVS. The AVS is a collection of data from within your electronic health record that is automatically inserted into a pre-written format, but it is not nearly as descriptive or as helpful as a clinical note. A good clinical note tells your story, integrates different aspects of your life, your illness, and your efforts to stay healthy…or to regain and maintain health. The graphic below is a real-life example showing how my note and AVS differ from one another. 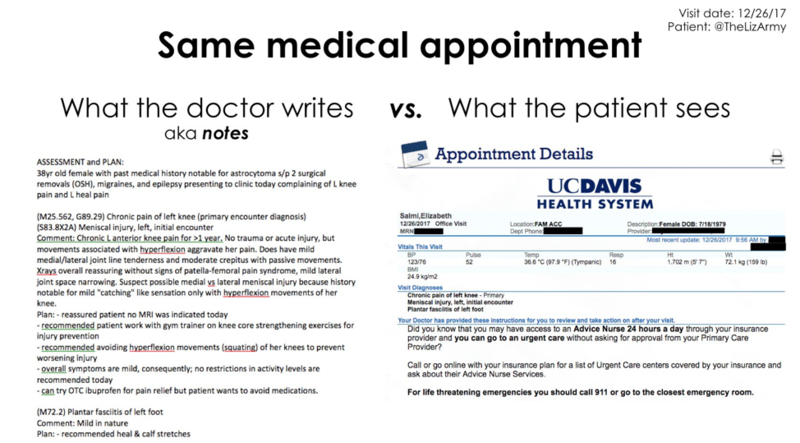 UC Davis Health is not a notes-sharing health system, so patients like me must submit a special request to get our notes. This takes time and effort, and costs are involved. How can I find my notes? First, check to see if your hospital or health system is sharing notes by looking at the OpenNotes map. If your health system is not listed on the OpenNotes map, ask your doctor for your notes. Here’s the letter I emailed to my doctor. Help us make open notes the standard of care for all patients. Here are 10 ways people can get involved with OpenNotes. Liz Salmi is the Senior Multimedia Communications Manager for OpenNotes. She was diagnosed with an astrocytoma (brain tumor) in 2008 and does not have access to her clinical notes. She has been logging her patient experience since diagnosis on the blog TheLizArmy.com, and now compares her blog posts to her clinical notes. Liz is a co-organizer for #BTSM (Brain Tumor Social Media) tweet chat, a group inspired by the #BCSM tweet chat. Follow Liz on Twitter at @TheLizArmy. OpenNotes is the international movement that’s making health care more transparent. It urges doctors, nurses, therapists, and others to invite patients to read the notes they write to describe a visit. We call these open notes. Follow OpenNotes on Twitter, Facebook and LinkedIn.